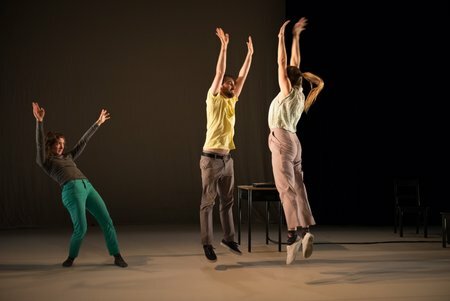 Tina Fushell’s Waving is Funny, a collaborative movement piece that “began as a joke” before becoming “a very real performance idea” sounds pleasantly kooky. There is something about examining the act of waving that appeals to me, a comedy goldmine just waiting to be explored. I was curious about the subject matter. How do people wave? What do we look like when we do? How does our environment impact this greeting? And how does this small act relate to other types of waves? The title suggests a wealth of material that could go just about anywhere. Waving is Funny is, sadly, not funny. There was a lot in this piece that I really did not like. I thought that as a whole, the various routines and individual dances lacked purpose. That seems like an obscure statement to make but for most of the movement whether to music or through mime, I was not entirely sure why it was there. Was I missing something? How exactly did that relate to waving? And if it didn’t refer to waving, why was it there? Fushell and her co-performers Luke Garwood and Molly Johnson were clearly invested in their material. As an audience member, I felt like I was constantly out of the loop, left to watch without the proper information to engage. Secondly—and I will fully admit this is a personal bias—was the terrible use of projections that served to distract the audience from the work of the performers. At first I thought they had a clear reason for their decision. As a preshow, the projection served a purpose: they set up a camera for the audience to wave at as they entered the space. The waving participants were then shown onscreen in the space for those already seated. It was cute. With enough people playfully waving this little bit of technical genius could really set the tone of the show. It was a neat, unusual, and fun interactive idea to introduce the underlying premise. Within the performance, however, the projections served as distractions. They repeatedly drew my eye away from Fushnell, Garwood, and Johnson without good reason. For instance, they played a two minute video of Garwood waving while he danced to the side of the screen. Considering that Garwood was also waving in person, I wondered why they needed a second visual representation of what he was already doing. To be fair, my guest did not have as strong a reaction to the work as I did. While she found most of it pointless, she highlighted the quieter coordinated movements in certain sections as being nice and pointed out that all the performers were very dedicated to their work. For me the only rewarding part of the experience was the fantastic sound design by James Bunton. It was absolutely beautiful, particularly in the slower moments my guest mentioned. The brief interludes were very relaxing, and Bunton’s work definitely served the performers well. In the program, Fushell notes “the humour lies in the truth.” I wonder if that is Waving is Funny‘s weakness, trying to create complexity in something straight forward. The best number of the show is a fun, genuinely adorable ‘jazz hands’ dance that felt more in keeping with the show’s preshow introduction. The dance was silly, it was tongue-in-cheek, and it played with waving as a performance technique as well as an act of human interaction. I feel that Fushell’s fresh idea got stuck when it was trying to add more weight to a subject that was better served by its simplicity. The jazz routine showed so much comedic strength because it was simple. Everything else was bogged down by excess; projections, movements that had no apparent reason, and a general lack of emotional cohesion. Overall I was relieved to finally wave this show goodbye. Wow, this review is remarkably off-base. What’s most apparent is that the reviewer has no experience or appreciation for contemporary dance, nor the capacity to process their emotional reaction into a considered response. The idea that the projections distracted from the performance is absurd. Equally, the idea that the best moments in this show were when it was “cute.” The dancers in this show are some of the best in the city, and they gave an intricate and arresting performance. As for “not funny,” at the show I attended, the audience was laughing throughout. It’s strange how disconnected this review is from what actually happened. It’s not just uninformative, it’s actually misleading. Please find something different to do with your platform than just spouting off. I went to the closing night performance of “Waving is Funny” and I couldn’t disagree more with your review. To suggest the content of the performance didn’t relate to subject of waving and how funny it is totally misses the mark. From the movements that the dancers executed to the new wave music they performed with and the wave themed projections both obvious and subtle,the theme of waving was visited throughout the show. I was able to enjoy the dancers performance without feeling bogged down by the visuals and lighting and the lighthearted, playful mix of the various elements worked well for me. I certainly didn’t think that the performance was too complex, as I was able to follow along quite effortlessly, while staying on point with the overall theme. I especially enjoyed the fun we had as an audience participating in the group wave performance. Good times!! The only part of your review that does resonate with me is when you wonder if you were missing something. The answer is to that is a resounding yes, it’s a sense of humour.